Diagnostic testing is genetic testing to diagnose a childhood condition or conditions that can be treated medically during childhood. An example is retinoblastoma (a cancerous tumour of the eye). 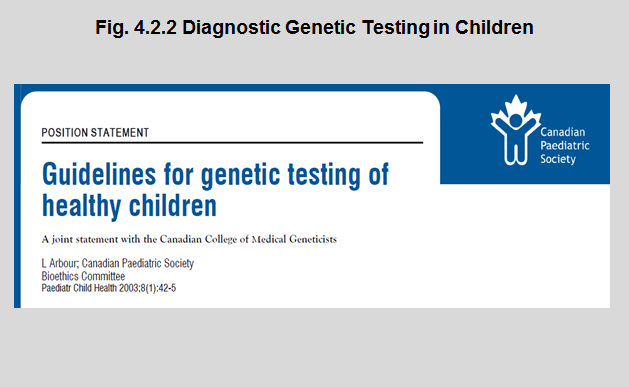 The Canadian Paediatric Society (CPS) and the Canadian College of Medical Geneticists (CCMG) have developed guidelines for genetic testing of children. • The best interests of the child should be the primary consideration when contemplating testing. • Parents should be informed of potential psychological and social risks associated with testing. • There should always be appropriate counselling and genetic service involvement. • Timely medical benefit to the child should guide genetic testing. • When genetic conditions will not present until adulthood, testing should be delayed until the child is competent to decide whether they want the information. • When carrier status for conditions is important only in reproductive decision-making, testing of children should be discouraged until the child is able to participate fully in the decision to be tested. • Clinicians should consider requests for genetic testing by competent, well-informed adolescents for the purpose of reproductive decision-making. For the full set of recommendations click here. 1Arbour L. Guidelines for genetic testing of healthy children. A joint statement with the Canadian College of Medical Geneticists Bioethics Committee, Canadian Paediatric Society (CPS) Ethics and Public Policy Committee, Canadian College of Medical Geneticists. Paediatrics & Child Health. 2003;8(1):42–5. Reference No. B03-01. Reaffirmed January 2011. Addendum April 2008.